Your average Nespresso capsule will cost around $0.75 for OriginalLine machines and around $1.00 for VertuoLine machines. While it’s much less than an espresso or latte at your local coffee shop, those costs add up. Quality pod alternatives at an affordable price. We’ve tasted nearly all of the best Nespresso compatible capsules and have landed on these 6 as the best, factoring in quality, cost, and reliability. The table below gives a quick summary of the 6 best Nespresso compatible capsules. See a lot of red Xs in the VertuoLine column? None of these companies make VertuoLine alternatives! The main reason Nespresso released their VertuoLine series was to introduce its capsule scanning technology, which prevents unlicensed capsules from being used. The result? No alternatives at this time for VertuoLine machines. Click each brand in the table below to jump to its section. HiLine imports their coffees from high altitude, small lot farms in Latin America, Africa and South America. To keep overhead costs down, they’re an online-only business without any physical storefront locations. As a result these capsules will run you about $0.45-$0.65 each. Each capsule has 5.0-5.5 grams of coffee with approximately 60-70 mg of caffeine (except decaf of course, which has about 1 mg of caffeine). You can read about HiLine’s pod compatibility on their website. 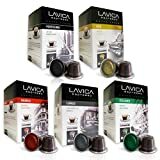 An Italian company that specializes in Nespresso compatible capsules, Lavica has a narrow range of very good pods. By flavor, these pods compare very well with Nespresso. I’d say at least 90% as good, which is great considering the savings. The biggest complaint I’ve heard is that the capsules all look the same regardless of which variety you get. If you don’t keep the different roasts separate, you’ll never figure out which is which. Headquartered in New York, NY Gourmesso sells a FairTrade Certified alternate to Nespresso brand capsules and make pods for both coffee and tea. Note that not all of their offerings are Fair Trade Certified (noted below by an asterisk*) and some are organic. Based in Amsterdam, Jones Brothers does a good job combining cost and quality. They don’t make the cheapest coffee. They don’t make the best coffee. But generally you’ll be happy with it for the price. Our 100% pure Arabica Nespresso capsules in this Variety Pack that includes two Ristretto blends (GIGOLO and NOIR), an extraordinary Espresso roast (ENIGMA), and two Lungo blends (REVIVE and ELEVATE). 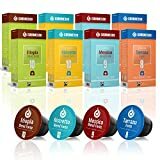 Coffee capsules compatible with Nespresso OriginalLine Machines including: Essenza, Citiz, U, Pixie, Lattissima, Maestria, Inissia, Kitchenaid and Prodigio. Our Capsules are NOT compatible with VertouLine Machines. Imported from Amsterdam since 2013, all our single serve cups are gourmet espresso, roasted without any preservatives, sugar or flavor added. Every bean in our coffee capsules adheres to world class sustainable farming practices and are UTZ Certified, Rainforest Alliance Certified, and Organic Certified. Jones Brothers Coffee delivers a superior single cup coffee pod experience. 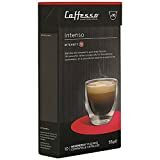 Try Jones Brothers Espresso Capsules if you've enjoyed products by Lavazza, Starbucks Verismo, Nespresso, Dolce Gusto, Solimo, Illy Iperespresso, or Bestpresso. Our well-traveled beans in these Nespressso capsules come to you from Central America (Mexico, Honduras, and Guatemala), South America (Brazil, Peru, and Columbia) and the rich coffee heritage in Africa of Ethiopia. Coffee — Caffesso capsules truly are no muss, no fuss and yield a high great coffee beverage with a barista-quality crema. Club — If you purchase your capsules through Caffesso’s website, you’ll automatically be enrolled in their Club where you can earn points to redeem for Caffesso products. Compatibility — Caffesso has gone the distance to ensure compatibility with a wide array of Nespresso machine models. You can read here to see all of the machines they support. Cost — Caffesso is a touch less expensive than HiLine. While I advocate trying all brands to see what you like, there’s no doubt Caffesso pods are pretty easy on your wallet. It’s hard to tell from pics but are these pods aluminum like the Nespresso pods which gives better pressure and in turn coffee. That’s a good (hidden) question! Does (or Can) anyone else offer aluminum pods that are compatible with original line Nespresso machines? I figure it is either cheaper to use plastic or prohibited to use aluminum other than the top foil seal. Does anyone use the cornstarch plastic mimic like they have started doing with “plastic” grocery bags? Hi, most of the capsules here are all plastic, which means they can be recycled as other plastics would be. While none of these companies have no dedicated recycling program, there also isn’t a need for it because they don’t use aluminum pods. Thanks for commenting! From the looks of things at the Tayst website and Amazon (including your link above), Tayst no longer offer Nespresso-compatible pods, only Keurig. The date at the top of this post is 20 Feb 2018. Is that an automatic ‘update’? Are you guys paying attention to availability? Hi Scott — Thanks for the comment. I actually reached out to Tayst and they told me they stopped selling their Nespresso capsules around the start of the year. There were some older capsules floating around on Amazon and other marketplaces, which obviously won’t do. I’ve updated the article to reflect this. Thanks! Do you have an opinion on Artizan classic Nes press o capsules. I suspect Artizan did not pay The Coffee Maven to be on this list so The Coffee Maven will not comment. Do you happen to know if any of these companies offer plastic capsules/pods that are BPA-free? The Jones Brothers Coffee capsules are plastic and BPA free. Thank you for commenting with this detail. Yes, thank you. I love that Nespresso provides recycling bags and that their pods are BPA free. I love coffee but try to limit my carbon footprint (can’t grow my own coffee!). Are the Nespresso compatible pods recyclable? What about Target’s latest offerings – Peet’s, Archer Farms, and Lavazza? These are all original pods, available in store in at least the first two cases. It’s hard to tell from your reviews: did you like any of these? Unfortunately I actually do not know this detail. Sorry!